The wacky weather here in central NC has continued into August. It started this spring and early summer as seemingly constant rain. 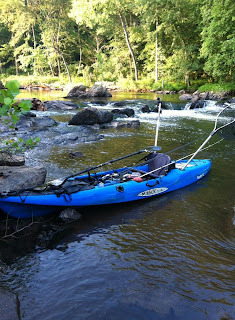 As noted in previous blogs, it greatly improved my high, muddy water skills and produced some sweet fish. Lately the weather has turned into isolated storms. The weird thing is that one basin might get an hour of high intensity rainfall while another basin, not 15 miles away, doesn't get a drop. This kind of random pattern was reflected in the USGS river gauges when I looked at them on Saturday. Rivers varied from normal level to within inches of flood stage. But I picked out a few that looked intriguing then pulled up Google maps to do some virtual scouting. For the second trip in a row, we settled on a river that we had never been to before. The levels looked good, the satellite imagery looked interesting, and location worked for us both, so we rolled the dice. Our risk turned into a huge reward - an amazing day of bass fishing on the Deep River. I fully expected to show up to a river with a bit of stain and a decent flow. But, to my surprise, the river was fairly clear and lower than anticipated. It was also a smaller river than I expected, often no more than 50 feet across. 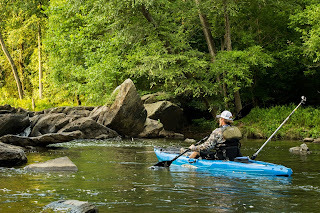 Bill and I were both happy to get to fish some clear water for a change, even if we knew it meant a little more dragging over the low water rock gardens. We re-tied our baits from dirty to clear water colors, prepped our gear, and slipped the yaks into the water. It was a cool, comfortable August morning as we started the trek up-river. It didn't take long before I got on the board with a solid 2 lber that ate a weightless worm skipped under some vines. The fish put up one heck of a fight as it ran circles around me - exactly why I love catching river bass so much. It was about this time that I mentioned to Bill that we needed to count our catches. Counting fish isn't something we typically do, in fact it is a pain, but a couple folks messaged me after my last report (the 50+ fish day highlighted by a 6 lb 10 oz beast) who didn't believe we had caught that many fish on such a small river. Little did we know, the comment about counting fish would kind of foreshadow things to come. We were picking off fish in the 10"-12" range in isolated pools before stumbling upon a large set of two shoals that dropped close to six feet in total. There were multiple plunge pools, resulting in numerous eddies and current seams. We dissected the area with buzzbaits, crankbaits, and plastics and landed over a dozen bass. It was a sign of the potential the river had. We portaged the shoals and before we even got back in the yaks I took a cast with my buzzbait. A fish blasted the bait out of the water, but didn't get hooked. I tossed a weightless worm back at the spot (a trick every angler should know) - BAM...fish on. Then I noticed other fish with him- they were in a wolfpack. A wolfpack is a group of bass that cruise around together, often in the mid- to late summer. Bill flipped a worm in their direction and - WHAM...we were doubled up. Despite a little chaos, we landed the fish and snapped a few pics of the dual 3 lbers. Then came the part of the day that kind of changed it all for us. We were fishing through what looked like great water and were barely getting bit. We were grinding for the few bites we got. I picked up a couple on a buzzbait and weightless worm while Bill struck with a popper and a buzzer of his own. We both agreed that maybe we needed to start focusing on the center of the channel more rather than pounding the wood cover on the banks. So I picked up my CP Baits Series 2, a bait which has been red hot for me this year, and started cranking the channel. Almost immediately, I started catching fish. I wasn't catching just one, but two or three per hole. Bill had started with a squarebill, but switched to a deeper diver, the Biovex Amp Medium Runner, and began hooking up too. It seemed like every eddy, hole, and boulder was holding multiple fish. I made the comment that on the way back down river we needed to switch to texas rigged plastics and work the wood cover differently because it was just too deep to not hold fish. About that time, Bill switched to a jig with a craw trailer. The jig was a mix of blue, green, brown, and purple with a june bug color trailer - a great bluegill immitator. Instantly he started getting bit. The change from a weightless to weighted offering had made the difference. From there out, the bite just never stopped. We began catching ten bass or more in every pool. We would stand in the Stealth 12's and flip or make long casts through the deep channel. When we got too hot, we would wade shallower sections with the yaks tied around our waists via straps. At one point, Bill caught 6 or 7 fish in a row off of one small brush pile. I was catching fish on literally every deflection I got with my crankbait - including one deflection that resulted in two fish at once. When we hit about 75, we realized we were going to catch 100 bass. When we hit 90, we realized we were going to cruise past 100. We hit a couple honey holes where we caught close to 20 fish without moving our feet. We rotated between cranks, jigs, t-rigged creature baits, weightless worms, and buzzbaits for the rest of the day, although 70% of our fish came on cranks, jigs, and creatures. When we hit our turn around spot, we were sitting at 110 bass. We had them so dialed in that we knew we could surpass 200 if we had a little more time. But we had to take some photos before we could head home, so we turned around and kicked it into high gear. We fished fast on the way back, but were still getting a ton of bites. 42 bass later and we were back at the car - for a total of 152 largemouths in roughly 8 hours on the water. That breaks down to 19 fish per hour, or 9.5 fish per person per hour, one fish (per person) every 6.3 minutes, or one fish (combined) every 3.1 minutes. We also ended up with 11 "other fish", which included a few monster bream/bluegill, a yellow perch, a white perch, and a few sub 10" bass which we didn't count toward the official total. Not to mentioned we had a pile of fish spit the hook. Our biggest bass were around 4 lbs with plenty of 3 lbers thrown into the mix. We also lost a couple brutes that were solid 5 pound fish. If there was any downside to the day, it was that we couldn't execute on the big fish and they came unbuttoned, but any time you have a day like we did, the downside takes a back seat to pure happiness. Although the other downside is that we were beat up. We both came home with raw thumbs to go with a couple purple fingers, smashed shins, and other bumps and bruises. We didn't take a ton of fish pics because we had cameras rolling for most of the day. I can not wait to see the GoPro footage! 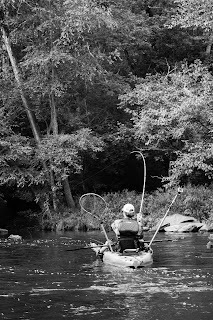 If there was one thing we learned, it is that the Deep River is not a place you want to be a baitfish - especially a bream. Any bream colored jigs or creature baits we threw at those bass got annihilated. My best set-up was a Deep Creek Lures Super Razor Beetle in the monkey grass color rigged on a 5/0 Owner EWG worm hook, Texas-rigged with a 1/8 oz bullet sinker. I like to fish that bait on a 7' Carolina Custom Rods Jig & Worm rod that is great for flipping and pitching in close quarters. I have a super high speed Abu Garcia Revo STX on the rod, spooled with 15 lb P-Line fluorocarbon. The combo makes for a super lightweight, strong, highly sensitive set-up. Shad and bluegill colored cranks got equally thrashed with reaction bite after reaction bite. It was one of those crazy days that we won't soon forget. Armed with a lot more knowledge of the river, we will be back to the Deep soon in search of a giant or two....and maybe the 200 mark. Sounds like an epic trip, I wish the river by me produced like that. I have been blessed with good river trips this year despite less than ideal conditions. Hopefully the luck continues! Sounds like a great adventure Drew. Always nice to get some lure intel as well. Thanks for the story and pictures. Thanks for reading, Chris. It took us a while to figure out the exact baits, but when we did...yikes! How is the fly challenge going? Forehead, meet palm. I am really torn about the fly challenge. 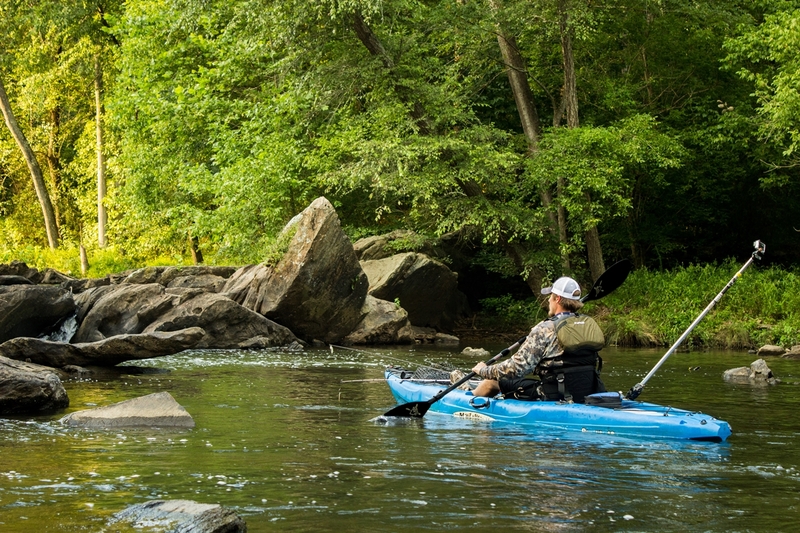 The high, muddy water put a damper on my fly fishing because a few of the places I know I can consistently catch good ones have just been a mess all summer. Then I got distracted by these big fish and then with scouting new waters. Plus guiding has had me crazy busy. So it will take a miracle to hit 50 (I am stuck at 4) and it will be a little deflating when that sinks in, but I am super happy about all the other doors that opened for me this year. Dude even if you had used flies in all of the locations you found. I doubt you'd have more than 20 at this point over 17inches. It's not easy. Definitely not easy, but doable, which I wasn't sure about when it started. The weather hasn't helped, but I also haven't spent enough time with long rod in hand. 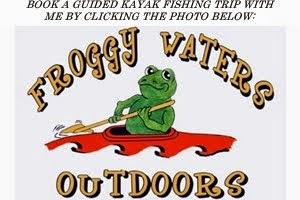 Nice place for kayaking and fishing really I miss it.